oh boy! You would never last here. The bathrooms are disgusting almost everywhere and no one is quirting soap in your hands even in our fancy hotel, but you are tipping for everything. Suggested tipping: 10 rupees per bag for bell boy, 20-30 rupees for waiter, 50-100 for the driver per non-work trip, etc. 44 rupees = $1. So, I have lots of per diem left. Lunch at the cafeteria anyway is about 42 rupees. As you walk anywhere you have to say “good morning/evening/whatever” to at least 6 people before you make it to your destination. Talk about no inward shell allowed. I’m ready to be done. 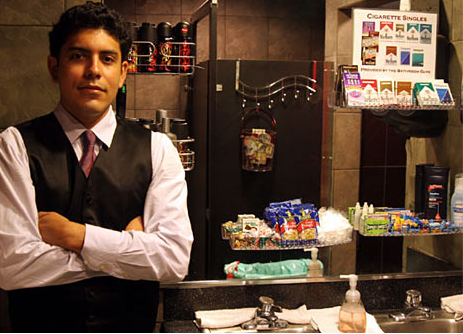 I’ve never had a female bathroom attendant…they’re always male. I rarely go to places fancy enough to have bathroom attendants though. You must be a high roller. They want a tip for watching you pee and pressing the soap squirter thing? Hah! That wouldn’t happen. I’m with you – I never carry cash either.